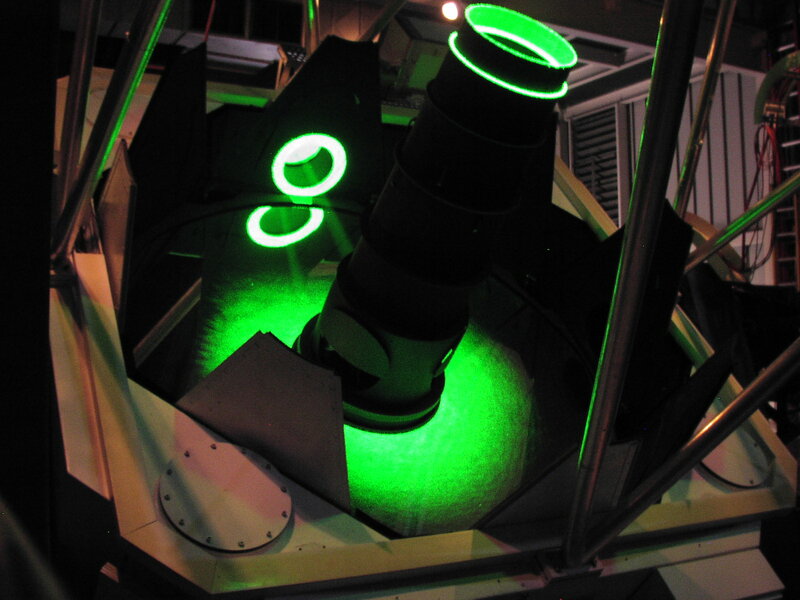 On July 24, 2005, APOLLO shone its laser out of the telescope enclosure for the first time. We were able to spend several hours pumping light at the moon, coming to understand the system. Another picture from July 24, 2005. Larry Carey is seen standing on the catwalk performing aircraft spotting duties. Bruce Gillespie is the other spotter, hidden by the pine tree. On some viewing screens, the green beam may be barely visible leaving the dome. The beam is about as visible as the Milky Way. Part of Ursa Minor is at right, and Draco at upper left. Photo by Gretchen van Doren. 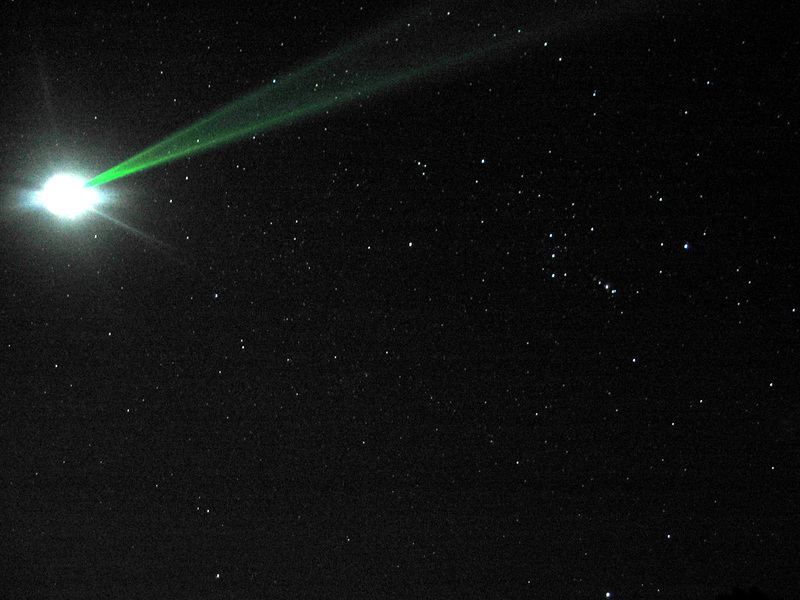 A picture from the August 2005 run by Gretchen van Doren, showing the laser beam making its way to the (over-exposed) moon. No, the moon is not exploding under the influence of our 2.3 Watt laser! 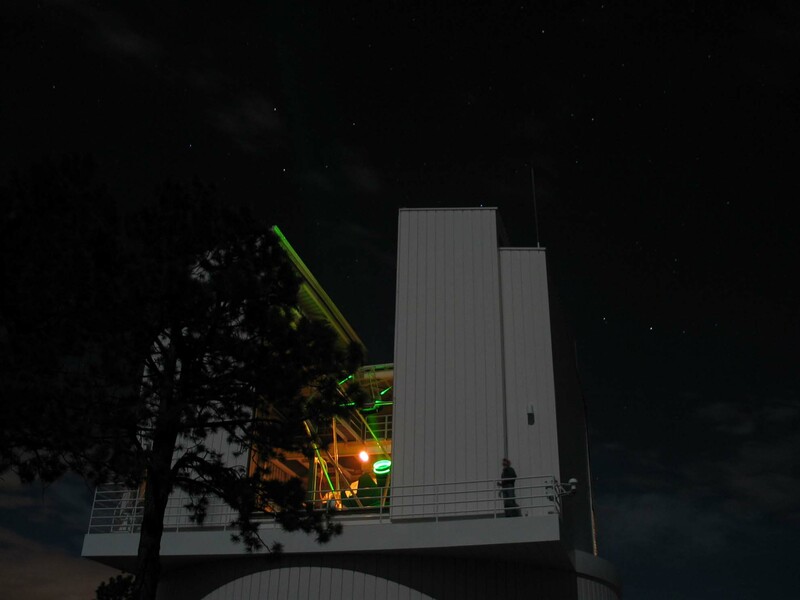 The edge-brightening of the beam can be seen, as the telescope secondary mirror robs the beam of light in its center. Orion is seen at right. A picture from the June 2006 run showing the back of the telescope, the APOLLO laser enclosure (left), the beam heading moon-ward, and the moon intself. The moon is actually a crescent, but so terrifically overexposed (16 seconds) that it looks rather round.